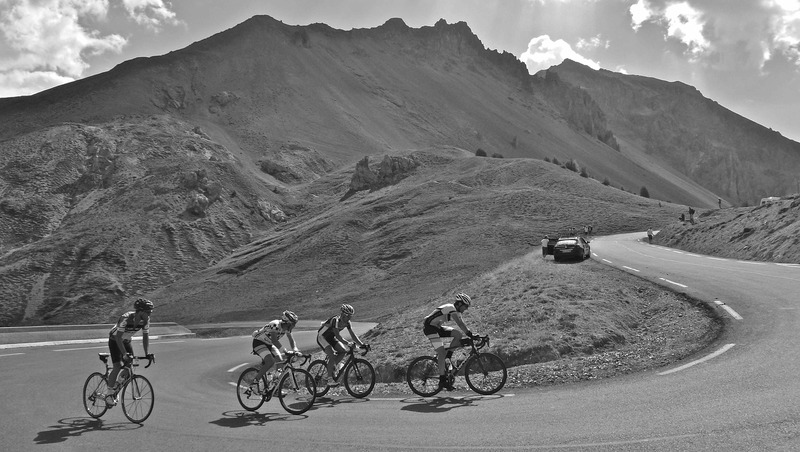 The wheels won’t be turning this year on the French alps and I am sad, it will be the first time since the beginning of the French Haute Route that we will not be traversing those familiar high peaks and welcoming the early morning sunshine. 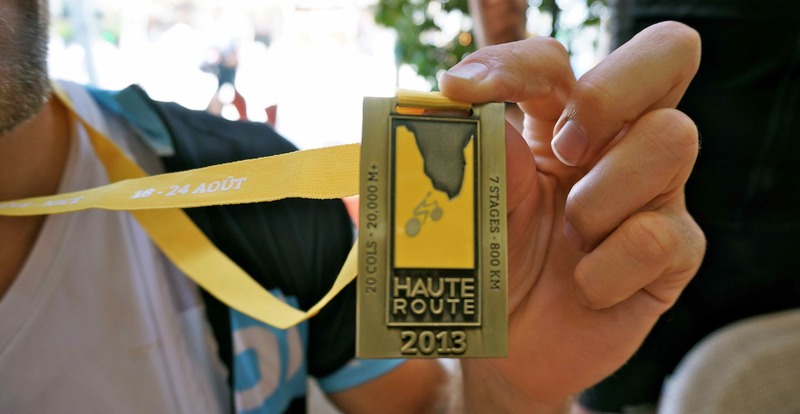 Instead we will be taking part in a new adventure: the first ever Dolomites Haute Route! 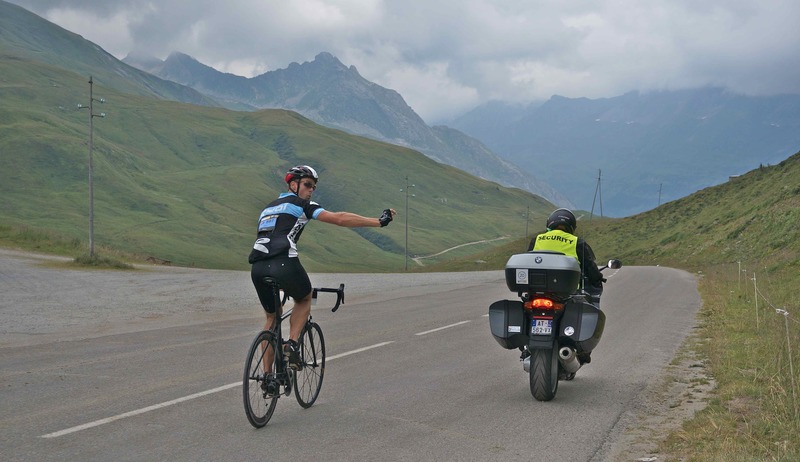 Last year’s French Haute Route was a barrel of fun as I wasn’t just supporting the Boyfriend, I was supporting a loveable group of cyclists who all knew each other. 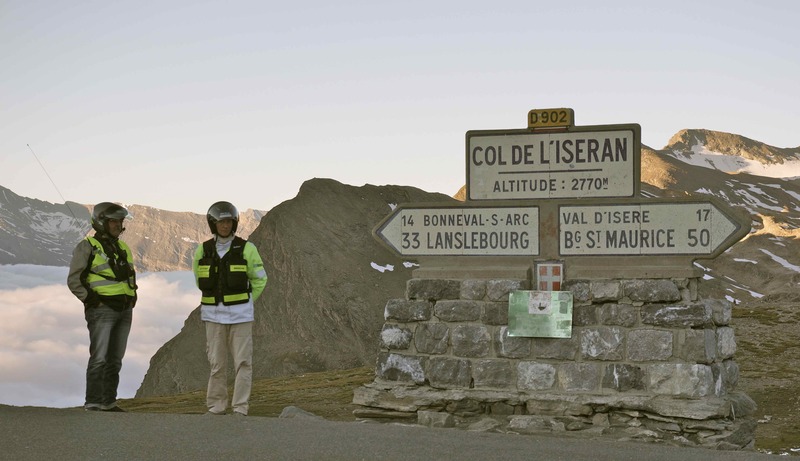 They were all extremely keen to take up the challenge of the Haute Route. I was the support crew. I would be up and out into the early morning’s silent darkness. Behind the wheel, the car would hug the corners of the skinny mountain roads. 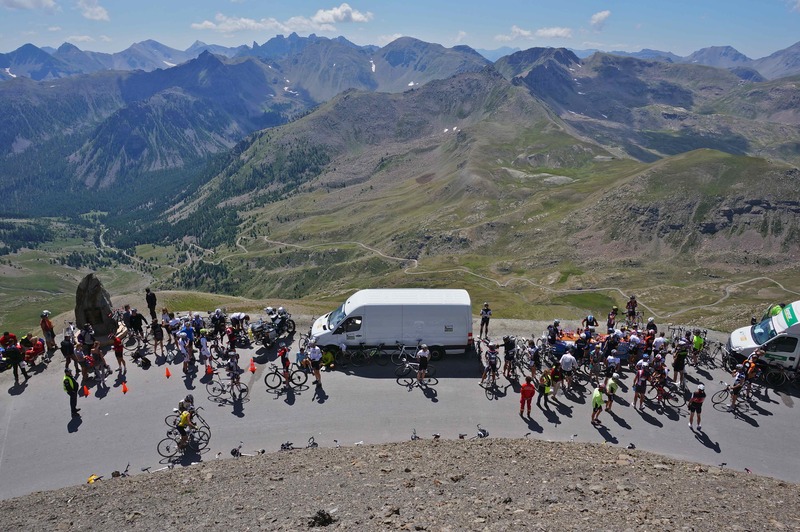 The roads would twist themselves to the top of the mountains where I would usually encounter the Haute Route crew automatically setting up the cyclists feed station. It was never a long wait at the top just enough time to appreciate the cool mountain air and the secret envelope of bewitching scenery at such a height and like an army of ants from below the cyclists could be seen marching their way to the top. The approaching roar of the motorbikes with their flashing lights warning everyone that the cyclists are on their way. Ready to cheer, clap and holler I release my ardent support to any one and everyone pedalling up the mountain on two wheels. The leading cycle group always seem so focused and fast, unwilling to stop. They are like rockets heading for the moon. 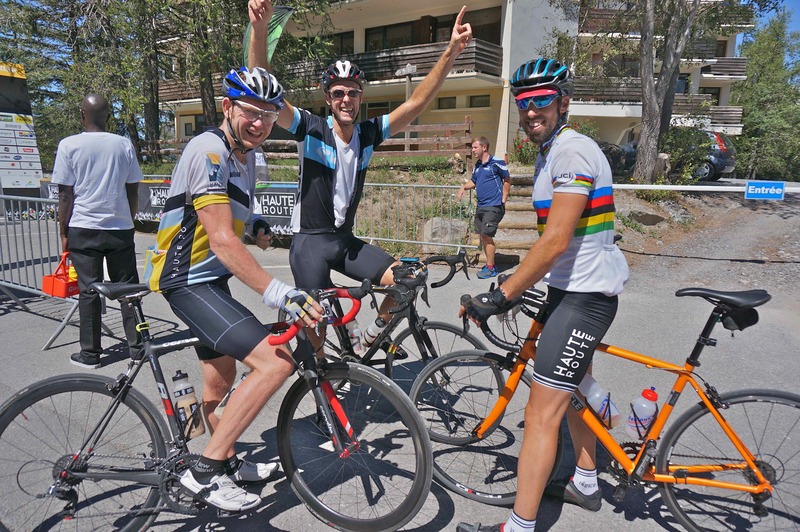 The climb to the top of the mountain seems easy for them, but to the rest of the cyclists, after relentless hill climbs and the top of the mountain in sight they reveal more of themselves without any hesitation. Observing the determination and strength in each person gives me goosebumps – internally they reach from within to push themselves beyond their own limits. It causes them to release a flood of emotions and the joy that is projected is like magic fairy dust scattering itself for all to delight in. This human spirit is contagious. The feed station is like a small piece of heaven to these cyclists. I can only imagine it to be like feeding time at the zoo, ravenous animals with no time to talk or be polite in case of missing out or losing his or her place. Mouths are be stuffed full with as much energy giving delights as possible. Liquid is then added to wash it all down and as quick as you can say ‘ Bobs your uncle’ they are back on their bicycles, heads lowered and speeding off down the mountain as if it were a slide in a playground. As soon as the boyfriend has cycled by I am back in the car, trying my best to beat him to the finish line – Usually I am there waiting for him and for all the other cyclists too… although I am often distracted by the changing scenery which nags at me to stop and appreciate its isolated beauty – it can be breathtaking and I try to imagine what it must be like on a bicycle? From mountain lakes to deep gorges… It is so easy to fall in love with the surroundings with which the roads travel. Every evening is spent in a new town and there are always opportunities to meet new people, make new friends and have plenty of laughs. With the added bonus of tasty local cuisine and bottles of wine. Tour de France, you don’t know what you are missing! 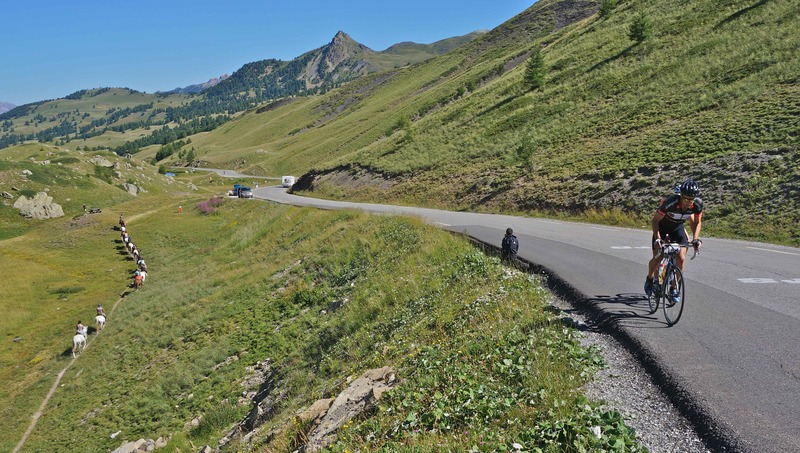 This entry was posted in cycling, France, French alps and tagged bike, blog, cycling, exercise, France, Haute Route, life, mountains, nature, photography, sport, travel, writing. Bookmark the permalink. Wow! What a great bike tour! Thanks for sharing! Great pictures…wow…-20C here today, your post makes me want to hop on a plane and go somewhere to ride. As for these particular climbs…maybe my wife could ride while I drive a car in support, sounds like you have a good thing going there! Roll on summer I say – I am glad that I made your day a little brighter! Good to hear from you – let me know if you ever are support and might be able to meet up on top of a mountain or two? I’ve been waiting for months for this post. It was worth the wait! Say hi to The Boyfriend and see you in 2015. Thanks for being so patient! Glad you enjoyed the write up! It was great to meet you and see you pedalling up those awesome mountains- sadly that fabulous new camera I bought came with a fault so hence the delays with my blog.. I will persevere – ha ha! Great post – thanks for the inspiring writing and brill photos! Good luck on your next challenge in the Dolomites! Thank you! always great to hear from the readers. I can’t wait for the challenge of the Dolomites! It’s the best sport, precious pictures. WHat a great acount of this fantastic event. Thanks for sharing your words and pictures. I’m looking forward to competing again in 2015. So great to hear from some of the riders! Thank you for your comments! I hope we can make 2015? Who knows where we will end up cycling? It is always like a magical mystery tour. That was a delightful post, bringing the experience right to life in this dreary end of winter season. Best of luck, and best of fun, in the Dolomites. Cheers! I am glad I managed to lift the winter weather for a tiny bit if your day!